Turks and Caicos Islands is a Caribbean chain of eight major islands and numerous uninhabited cays located 575 miles south of Miami and 39 miles southeast of the Bahamas, just north of Dominican Republic and northeast of Cuba. The islands of the Turks and Caicos are pristine nature preserves and sultry Caribbean resorts perfect for a family beach vacation. From the main tourist center of Providenciales to the quiet and tranquil islands of North and Middle Caicos, to the historic Capital Island of Grand Turk, each island in the Turks and Caicos has a unique character. During your Turks and Caicos beach vacation experience a great year-round climate, breathtaking beaches, and many underwater activities including scuba diving in coral reefs full of marine life. Learn more here! Turks and Caicos Islands is a Caribbean chain of eight major islands and numerous uninhabited cays located 575 miles south of Miami and 39 miles southeast of the Bahamas, just north of Dominican Republic and northeast of Cuba. The islands of the Turks and Caicos are pristine nature preserves and sultry Caribbean resorts perfect for a family beach vacation. From the main tourist center of Providenciales to the quiet and tranquil islands of North and Middle Caicos, to the historic Capital Island of Grand Turk, each island in the Turks and Caicos has a unique character. During your Turks and Caicos beach vacation experience a great year-round climate, breathtaking beaches, and many underwater activities including scuba diving in coral reefs full of marine life. Turks and Caicos is known for having some of the world's most beautiful beaches, pristine coral reefs, diving, fishing, and vacation villas. More recently, Turks and Caicos has become a destination for the "rich and famous". Some say it is due to the manner in which the Turks and Caicos islands are protected by their government, dedicated to preserving the islands' uncomplicated lifestyle and natural beauty, the ideal setting for a Turks and Caicos vacation rental! Turks and Caicos consists of 40 different islands, only 8 of which are still inhabited. The islands of the Turks and Caicos are almost as diverse as the people who inhabit and vacation there. From the main tourist center of Providenciales to the quiet and tranquil islands of North and Middle Caicos to the historic Capital Island of Grand Turk; each one offers a different experience and a unique character. 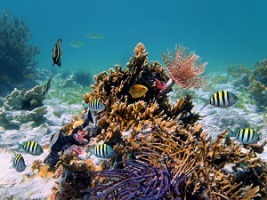 Each island offers great year-round climate, breathtaking beaches, and many underwater activities. The variety that each island provides gives a great answer as to why 60% of visitors return there next year. A particular place that one should visit while staying at your Turks and Caicos vacation rental is Little Water Cay, or Iguana Island, as the locals call it. 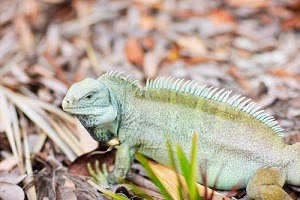 This small-uninhabited cay is home to hundreds of Iguanas; in fact there is a boardwalk that takes you on a tour to see of these interesting creatures. Go to Caicos and Turks where you can cruise along the uninhabited cays, snorkel for sand dollars and conches, and collect shells from the white, sandy beaches on a private cay. After visiting the different and beautiful natural wonders the island offers, retire to your private Turks and Caicos villa, providing a relaxing and peaceful atmosphere for you to enjoy.